This is the second Sherlock Holmes film by Guy Ritchie and it’s pretty poor. This film came out in 2011, a year later than the excellent BBC series. To say there has been some borrowing is a little of an understatement. There are sections of music that sound very similar, Sherlock, Mycroft and Watson have all developed similarities with their BBC counterparts and it’s hard to take it all seriously. I find it difficult to imagine Sherlock as a street fighter and it seems like it’s one action scene to another and almost forgetting any kind of plot. The question is, would the two films appear different if the BBC hadn’t made their own series? They are fun, there’s some stylised slow motion sequences that are good to watch, but ultimately, they aren’t cerebral enough, in fact they aren’t all. 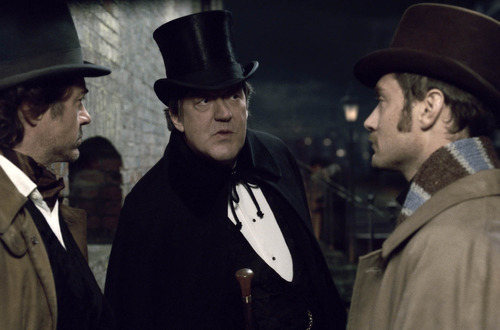 Stephen Fry does make a good Mycroft, but he’s not as sinister as Mark Gatiss’ depiction. Moriarty is pretty forgettable, in fact, he’s more like a classic Bond villain and he’s hammed it up. Some advice, spend your time watching the BBC series because it’s very good and this isn’t.